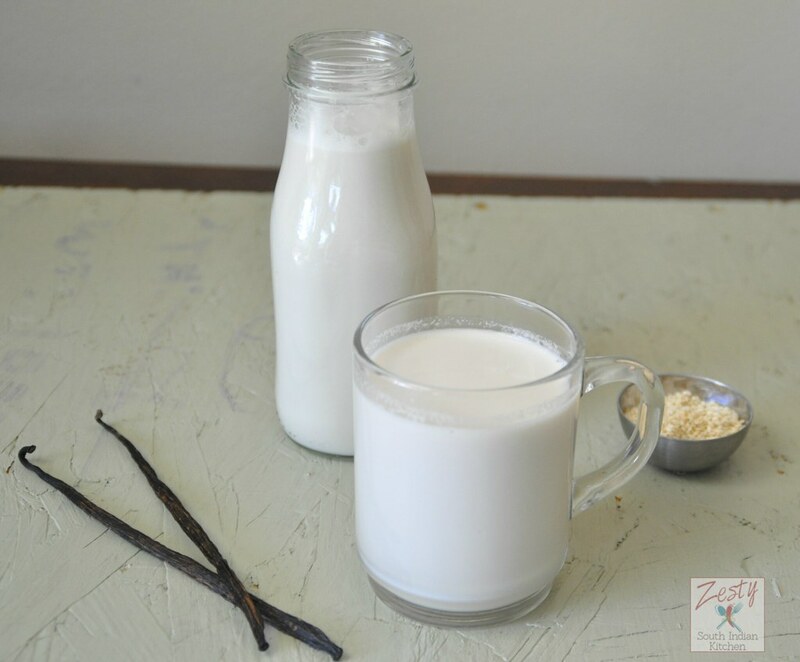 Delicious vegan milk with more calcium . The last few nights I have been having a hard time getting any sleep as my son keeps waking up and crying several times, as his eczema is getting flared up. Poor guy can’t sleep and tries to sooth himself by scratching all over the body. I tried keeping his skin moistened, but sometime he wants to do it himself and not doing it properly. I need to find new ways to help him. He can’t drink any milk products, as he allergic to it. He is only drinking almond milk still it is not helping him too much. 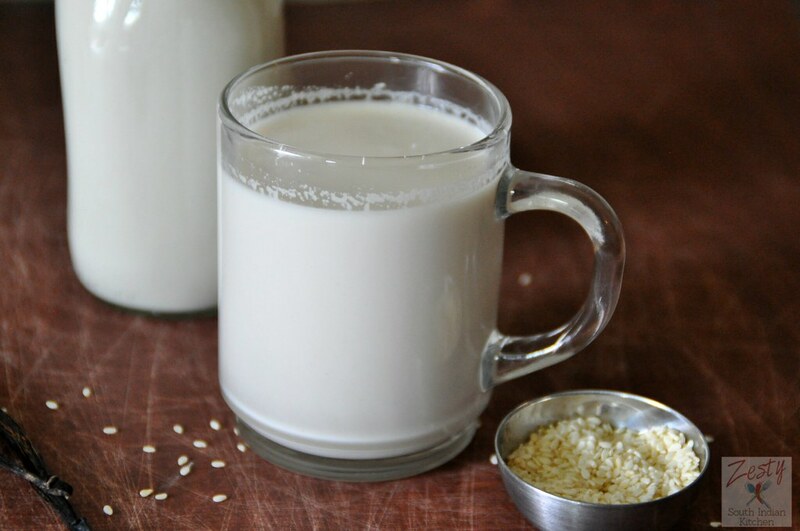 So I am in search of new products which he likes, for that reason I made this vanilla sesame seed milk. It is delicious, but you need to be fan of sesame seeds taste. We both I and hubby likes sesame seeds a lot, as we grew up with sweet treats made with Sesame seeds. However my kids are not much fan. So we both finished this drink. This recipe is from the book The Street vegan, and is part of a review of the book here. Sesame seeds have been part of Indian cooking just like Japanese, Middle Eastern and Chinese cooking. For our famous breakfast dish dosa, it is cooked in sesame seed oil on a hot griddle, also for the pickles the sesame seed oil is must. I came into contact with hulled sesame seeds/white sesame seeds only after leaving India. In India, we use only the black one which is not hulled; it is earthy nutty and slightly bitter and is a power house of nutrients. Sesame seeds are packed with nutrients such as Vitamins B1 & E, calcium, and iron. It also has copper, better known for its anti-inflammatory ability and has been shown to reduce some of the pain and swelling associated with rheumatoid arthritis, is also a supporter of bone and blood vessel health. The taste is enhanced when toasted, but unfortunately, the high concentration of healthy fats (polyunsaturated fats) is damaged when the seeds are heated. No matter what color, the seeds are from the same tropical plant and taste almost identical. Do you know a tablespoon of sesame seeds contain about 88 mg of calcium? Also a quarter cup of natural sesame seeds provides more calcium than a whole cup of milk. A quarter cup of raw natural sesame seeds has 351 mg of calcium while one cup of non-fat milk has 316.3 mg, and one cup of whole milk has only 291 mg of calcium. And sesame seeds are alkaline whereas milk is acidic. However, the calcium level decreases about 60 percent when the hulls are removed from the sesame seed; one more thing the form of calcium in the hulls is calcium oxalate, a less absorbable form of calcium. For this recipe you need un-toasted white sesame seeds, maple syrup and coconut oil along with some vanilla extract. It is really easy process. Soak them for some time and make the milk and serve chilled. If you are fan of Middle Eastern Tahini sauce or Halva you will like this, also it is excellent base for ice cream and milkshake. Give it try you will like it, even if you are not a vegan you can enjoy this milk once in a while. If you are vegan this is great addition to your recipe. 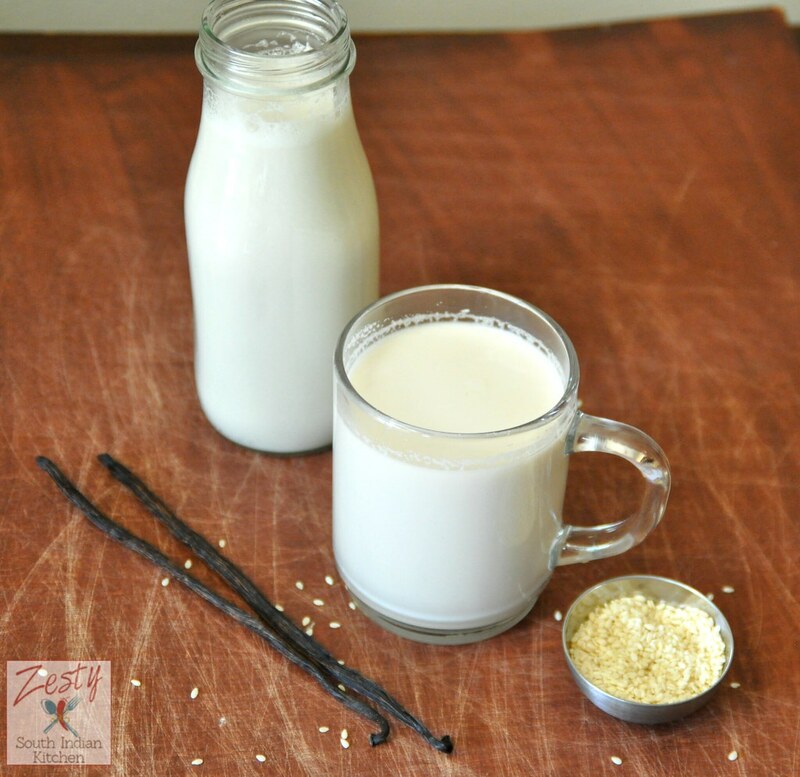 Delicious vanilla sesame seed milk you can take them as such or as excellent base for ice cream or milk shake. Place the sesame seeds in the pitcher of high speed blender and cover with them ½ cup water. Let soak the seeds for 30 minutes to an hour. Blend the seeds and their soaking liquid on high speed blender for 40 seconds; add the vanilla, coconut oil, maple syrup and salt and 1 ½ cups water to blend as smooth as possible. Then strain the sesame milk through a fine mesh strainer. Store the milk in an airtight container in the refrigerator for up to 3 days. • Gluten Free • Low Sodium • Vegetarian • Low Fat • Wheat Free, Drinks, Vegan. What an excellent recipe Swathi! Milk with sesame seed s something new to me.. Should try this..
Nice attempt to create a wonderful milk out of sesame seeds.Does adding of salt makes the milk little salty ? regular milk taste bit salty ,but how is this one ? Yes adding little salt will enhance the taste. But this one is not salty taste still can get the taste. wow..good invention Swathi..helpful to some ..
How is your son now..Try out poppy seeds 2 to 3 tablespoons of..raw poppy seeds soaked in water and grind it with soaked almonds. (with or with out skin)..it churns out nicely …you can add vanila essence or anything suitable to him..God bless him ….Swathi.. Thanks Nalini, I will try, he is fine, now I got some medications for him. hope it will help him. So surprising… We use only white sesame seeds in our cooking (I’m from Bangalore), and I had never seen black sesame seeds till I got married… India is so diverse! 🙂 I hope your son feels better soon Swathi.. And I think I might give this a try… I want to experiment with non-dairy milk in our daily diet. Have you tried this with coffee? Do you think it will taste good? Yes India Is diverse we can see lot of different varieties there. I haven’t tried making coffee with this milk. I think it will not be good. very interesting.nice to knw abt a new recipe. Very unique and interesting recipe!! Looks so rich and creamy!! This sounds not only healthy and good but tasty too! I really enjoy learning new recipes over here, Swathi! Pinning! Nice alternative for regular milk, hope kutty gets better and god bless!